One of the most significant topics of discussion again this year was Microsoft Office 365. With over 120,000,000 commercial monthly active users and counting[i], Office 365’s flexibility and functionality are reshaping how companies store, manage, and interact with their data. Unsurprisingly, this has substantial implications for policies, procedures, and best practices regarding data portability, retention, analysis, and privacy. It was clear from the volume and scope of discussions at Legaltech 2018 that the great migration from legacy repositories to Office 365 is well underway. While Office 365 offers users considerable control over the relocation of their data, using that control intelligently is key. A data migration represents an invaluable opportunity to take stock of what data should be relocated, how it should be organized, and what rules should be applied to the data when it is moved. The axiom “measure twice, cut once” is particularly applicable to an enterprise data migration project. Stakeholders from across the organization, including IT, HR, legal, compliance, data security, operations, and finance must collaborate to identify a process that complies with the various and increasingly complex requirements. The expertise to accomplish this often does not lie within the organization’s core competencies, so selecting a trusted advisor with the needed know-how and resources to assist with the assessment, mitigation, deployment, and training needed for long-term success is critical. With the EU’s General Data Protection Regulation (GDPR) set to go into effect on May 25, 2018[ii], thought leaders continue to evangelize the importance of conforming business and legal practice to the requirements of one of the most stringent data privacy laws ever implemented. Legaltech saw no less than twelve presentations addressing data privacy, with four of them specifically focusing on the implications of, and strategies for compliance with, GDPR. 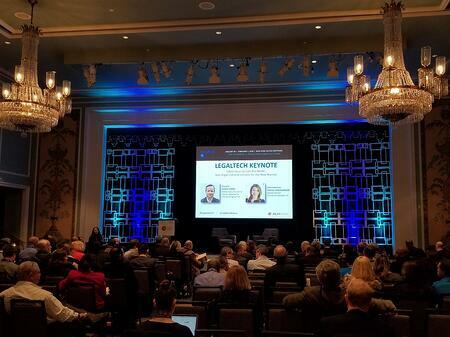 Each session was well attended, attesting to the heightened awareness of this regulation, and the desire by counsel and technologists alike to be able to integrate emerging best practices into their operational models. Participants at Legaltech 2018 took to heart the recurring warning that, although it may be tempting for stateside companies and law firms to discount the importance of a rule promulgated by the EU, they do so at their own hazard. GDPR has global reach, and can impose substantial penalties on any business or professional entity that mishandles data falling under its purview. In short, any data that either resides in the EU or is in certain ways associated with a business or individual who resides in the EU, may be subject to GDPR oversight. It is critical that anyone who even might come into control over data regulated by this rule, understand and ensure compliance with GDPR. Another topic of significant interest at Legaltech 2018 was the rapid emergence of analytics and artificial intelligence. Technology-driven solutions have become increasingly prominent in data analysis and ediscovery due to advances in machine learning as well as improved acceptance of, and even a growing appetite for, the immediate, accurate, and intuitive functionality available in an ever-increasing number of off-the-shelf applications available to practitioners. It is understandable then, that users will want to leverage this kind of processing power to achieve ever-faster understanding of their data. As this becomes possible, they will become increasingly expectant of more immediate analysis of ever larger data sets. This feedback loop will only serve to accelerate the innovations and availability of more powerful, more intuitive, and more integrated artificial intelligence. From the technology of data storage, integration, and accessibility, to the privacy implications associated with technologically managed data, and the rise of still more technology that learns and analyzes that data better and faster than ever before. Perhaps never more so has the “tech” in Legaltech been so apparent than it was at Legaltech 2018. If you have any questions, or would like to further discuss these trends and how they may impact you, please feel free to contact me at gcreighton@lhediscovery.com. [i] Foley, Mary Jo. “Microsoft Office 365 Now Hass 120 Million Business Users”. ZDNet. Web. 26 Oct. 2017. [iii] Josh Becker, Patrick Fuller, Sr., Scott Reents. 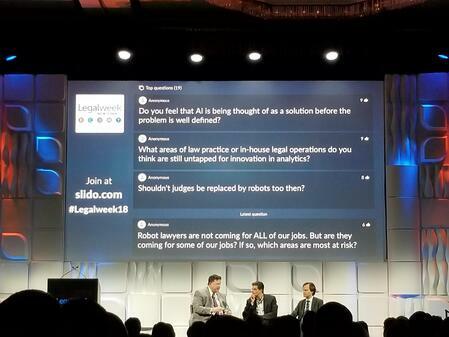 “Legalweek Keynote – Fireside Chat on Legal Analytics and the Future of Data Driven Law” Legaltech 2018. New York, New York. 31 Jan. 2018. Lecture.